Harwood Art Center presents Bridge: Arts & Social Justice, our annual juried exhibition dedicated to themes of social, political and environmental justice through the eyes of artists. Aún No Escrito / Unwritten by Kemely Gomez is inspired by current political discourse in the United States. With our focus on the Zero Tolerance immigration policy, the media has been a leader in conveying the immense amount of controversy surrounding the issue. However, they have been so centered on the politics and statistics that they have neglected the individuals who have been affected by those policies. Because of this, Gomez wants to give immigrants the power to share their stories, memories, and emotions. For this project, Gomez invited immigrant families in her community to participate. After having conversations with them about their experiences, she created bags on which she embroidered the memories and emotions of their journeys. 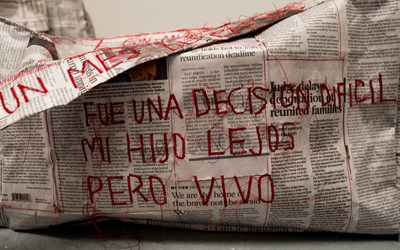 Each bag was made by sewing newspaper—specifically, those articles that focused on immigration—so that the embroidered messages cover the stories written by the media. These bags represent these people’s journeys and their struggles for adaptation. When they made the decision to leave their native country, there was a lot of both positive and negative energy that was packed inside of their luggage. Those bags were filled with their hopes and goals as well as their sorrows and fears—all as they had to leave everything behind. Their stories didn’t end when they arrived in this country. There exists memories and emotions that these people will never forget. Home is a wall installation to be created the night of the opening through audience collaboration by writing messages about our personal meanings of home; this may include poems, songs, thoughts, or experiences. These messages will be written on pieces of fabric, which will then be tied onto the structure on the wall. The work intends to promote self-reflection and human connection by sharing stories and uniting them in a single community.